The Scooterist Meltdown Custom & Trade Show has been growing bigger every year. International dealers from Germany, the UK and Benelux have been offering new parts and used parts, scooters and clothing. In 2020 we have more than 60 dealers on the Custom & Trade Show. For now have a look at the dealer list 2019, the dealer list 2020 will be published in January 2020. To run a stall (space is FREE!) 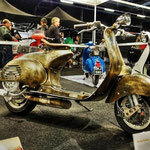 or display your scooter in the custom show simply contact us. Want to run a stall at Scooterist Meltdown 2020? For more information and contact click here. You own a neat scooter and would like to show it to the world? Nothing's easier than that. Click here for more information about how to apply.